I typically start my day with a light, nutritious breakfast. When I worked in the afternoon and evening, I would cook first thing in the morning and have a big hearty breakfast and start prepping ingredients for cooking lunch. Now that I work a more standard 9-5 day, I don’t have time in the morning to do that any cooking. But I make my coffee and blend up a green smoothie. It’s easy to prep while the coffee brews and I feed the bunny, and easy to sip while I do my makeup and get dressed. I’ve tried having oatmeal or a sandwich instead, but it’s too messy while I’m rushing around and too heavy in my gut for the two mile walk to work. This week’s smoothies have been more purple than green – steamed beets, banana, blueberries or cherries, flax seeds, and almond milk. For lunch, I do my best to cook something on the weekend to pack up for at least the first part of the week. Later in the week I will pack up other dinner leftovers. Worst case scenario, I take dry oatmeal with raisins or other fruit and nuts, or sometimes a savory version with peas and greens. This week we’re going out of town on Thursday, so I only need three meals, and I also need to use up some stuff in the fridge. I made tofu scramble with peppers, mushrooms, and peas for Sunday morning breakfast, then packed up the leftovers with some millet. There wasn’t a ton of scramble left, so I stretched it out with extra peas and a tablespoon of sunflower seeds for each serving. I also packed up a side of raw broccoli and hummus. I have celery and cucumbers to take on the other two days. 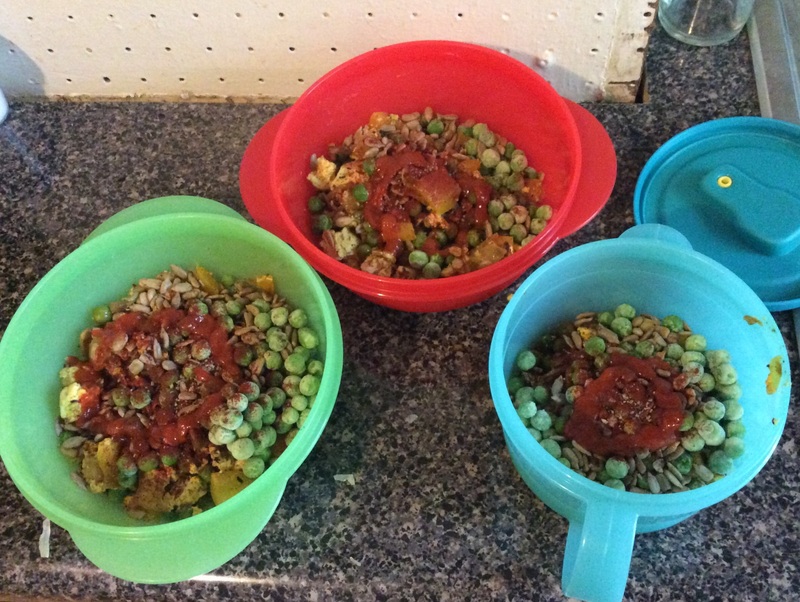 Three little bowls: pre-millet, but post-sriracha. My dinners can be a little scattered. My manfriend usually gets home much later than I do, so we don’t always have dinner together. That’s just one more reason I try to cram a lot of nutritious food into the first part of the day! After walking home in the heat, I want a snack right when I walk in the door. Depending on my mood, I might have a bowl of popcorn, some chips and salsa, or even just fruit. If I’m really hungry, I eat some leftovers or a bowl of oatmeal. I’ll cook something light later on if we’re hungry, although I do make it a point to cook a proper dinner for two at least once a week. Combine the garlic and tomatoes in a bowl with some salt and pepper. Let them sit while you prep everything else. Cook the pasta according to package directions. During the last 2-3 minutes of cooking, add the broccoli. 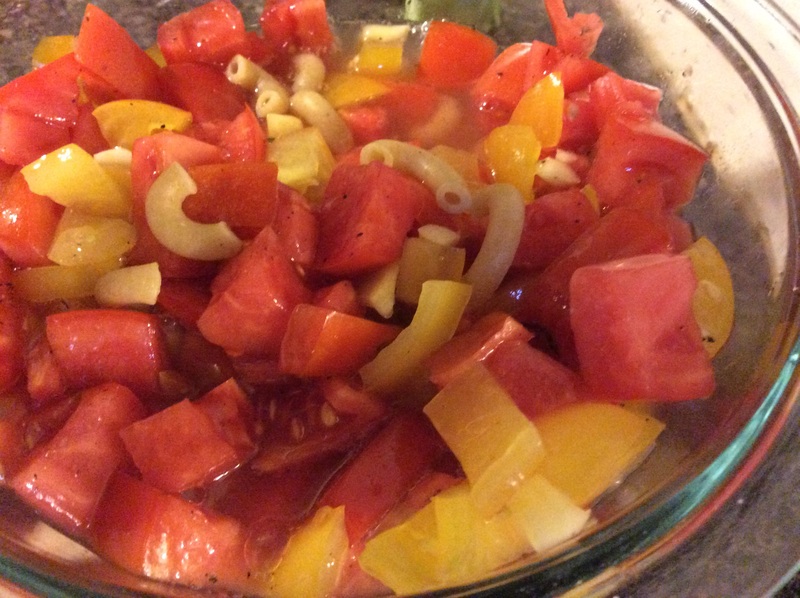 When it’s done cooking, ladle off some pasta water and add it to the tomato-garlic mixture (this warms the tomatoes and makes it easier to toss). Drain the pasta. Sometimes there is pasta in the pasta water. 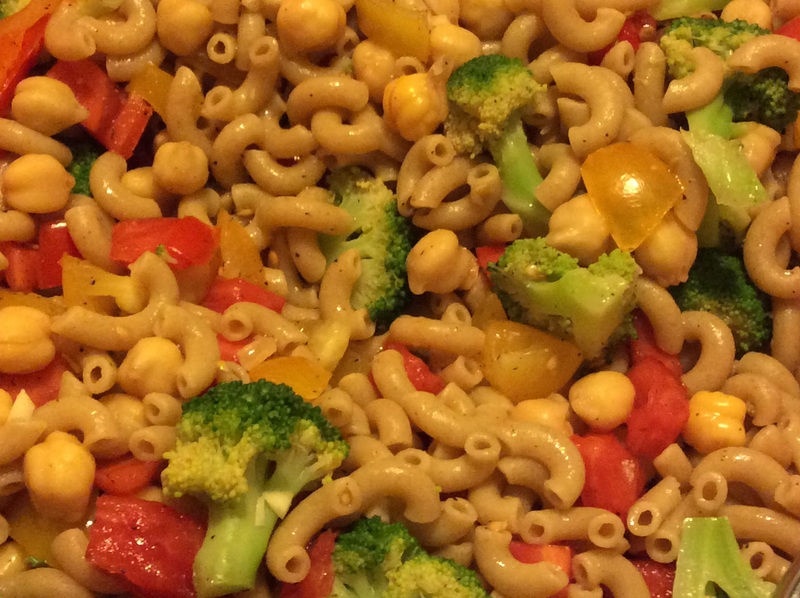 Toss the chickpeas, pasta and broccoli, and the tomatoes in a big bowl. Season with salt and pepper to taste. Add some fresh basil or parsley if you have it! (I didn’t.) Gobble it up! Not gonna lie: I ate a lot of this. I followed dinner with a tiny bit of dark chocolate. And that’s my day, folks! I recorded a good one for you, just to be clear. There are plenty that involve eating chips on my way home from work because my job is depressing sometimes, and others that feature wine and take-out Thai food, but I always strive for one like this. Aside from my after-work tortilla chips and salsa, it was pretty low on processed foods, including cooking oil. I’m always amazed at how many calories oil adds to a dish! Every time I cut it out, I drop a few pounds. If you want to learn more about why oil is not great for you, check out Forks Over Knives. The film is eye-opening and they have some super recipes on the website. Anyway, my point as always is that with a little planning, a healthy diet isn’t that hard.